Sir Simon Rattle is to join the London Symphony Orchestra in 2017, and has been doing some strong lobbying to get a new concert hall in London. What is wrong with the current venues? And is it worth £100-200 million to build a new one? Simon Rattle has been lucky to have been resident in two high quality concert halls. 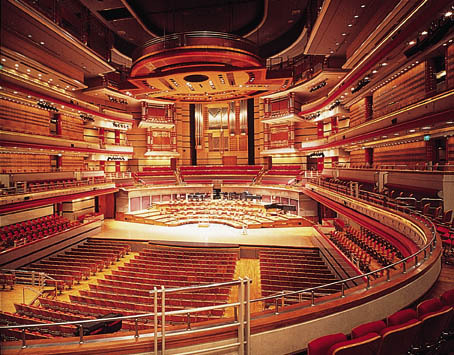 Pictured above is Symphony Hall in Birmingham, which was opened in 1991. The acoustic design was done by the late Russell Johnson and is often quoted as having the best acoustics in the UK. Unlike most large concert halls, this was not a one-off design created by a starchitect. This is one from a small family of halls around the world with a similar design based around the traditional shoebox shape, with each newer hall being a refined and improved version. The first was in Dallas and the last in Lucerne. This gradual refinement meant that Lucerne is often seen as one of the best auditoria in the world rivalling the best classical halls. At the moment, Sir Simon is conducting in the iconic Berlin Philharmonie. Opened in 1963, this was the first example of ‘music in the round’ for large classical venues. As the architect Hans Scharoun described, ‘The orchestra and conductor stand spatially and optically in the very middle of things; if not at the mathematical centre then certainly completely enveloped by their audience’. To accommodate this radical idea, the acoustic designer Lothar Cremer broke the audience into blocks now known as vineyard terracing. How do the three major large venues in London, The Barbican, Royal Festival Hall and the Royal Albert Hall compare to Birmingham and Berlin? Unfortunately, from a purely acoustic standpoint, the London halls all have flaws. The most famous architectural acoustician is Leo Beranek, who has produced a rank ordering of concert hall acoustics from around the world. Unfortunately, the vast Royal Albert Hall (RAH) is at the bottom of the list. Built in 1871, RAH pre-dates Wallace Clement Sabine’s pioneering work applying modern scientific methods to room acoustics, so maybe the acoustic failings are understandable. Even with today’s extensive scientific knowledge of how sound behaves in rooms and is perceived by the listeners, no-one would attempt to make such a large hall for orchestral music. While the orchestra is radiating music into the hall, at the same time the audience members and their clothing is causing this sound to be absorbed and removed. In a large hall, nearly all the sound absorption comes from the audience because the walls, ceiling and every other surface are made to reflect very efficiently. The only exception is the seating, which has to be padded to be comfortable, and so is designed to offer the same absorption properties whether someone is sat in the seat or not. If there are too many audience members, then the orchestra has to play harder to get the sound impressively loud. But there is a limit to how loud an orchestra can play, and consequently there is a limit to how many people should be in the audience. A typical maximum number of people that can be accommodated before the acoustics suffer, allowing for modern comfortable seating, is around 2,200. The Royal Albert Hall has over 5000 people in the audience. To get a loud enough sound in the hall, requires a huge orchestra, double the size normally used. Even if it could be made economic to use such a huge orchestra, the elliptical shape of the auditorium causes problems with focussing and there would still be insufficient surfaces reflecting sound quickly to the audience. 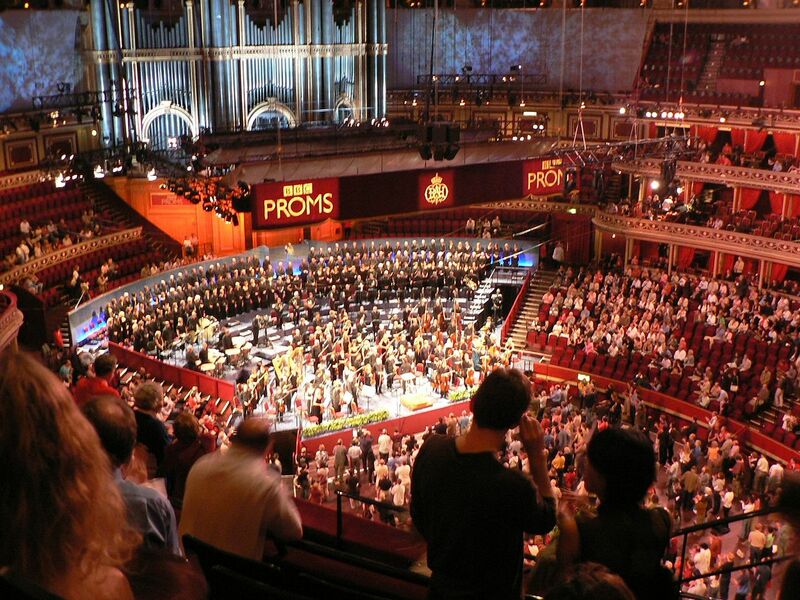 Despite being a space that, as Beranek puts it, ‘is much too large ever to be fully successful [as a concert hall],’ the Royal Albert Hall annually hosts the hugely popular BBC Proms, which is probably the largest classical musical festival in the World. I have been to a couple of Proms and enjoyed the concerts. Why? Although it pains me to admit it as an acoustic engineer, there is more to a concert than just the sound. Seeing a concert in the iconic hall is a great social event. The Royal Festival Hall (RFH) in London was built as part of the Festival of Britain in 1951 using state-of-the-art acoustic science. Unfortunately, the figures available for how much an audience absorbs sound was wrong. The number used was about 60% of the true value. This explains why the RFH is often described as having an acoustic that is ‘too dry’, especially for bass instruments. Or as Simon Rattle put it slightly more bluntly, ‘The RFH is the worst major concert arena in Europe. The will to live slips away in the first half hour of rehearsal’. With 2900 seats, there are just too many people in the audience. Hope Bagenal, the original senior acoustic consultant for the hall, recommended removing 500 seats as a remedial measure to improve the acoustic. But this wasn’t done. Back in the 60s, a revolutionary solution was sought, to use electronics to artificially enhance the acoustics. The assisted resonance system was a remarkable feat of engineering considering the crude electronics available. The use of artificial enhancement with classical music is so controversial that when the assisted resonance system was first installed it was brought in gradually without telling the orchestra, audience or conductors. Once the full system had been covertly used for eight concerts, the engineers then dared to reveal its presence. The electronic enhancement was removed in 1998 and what is heard now is the natural acoustic. Extensive remodelling was undertaken from 2005-2007 that raised the reverberation time. The reverberation time is a measure of how long the sound lingers in a space once the orchestra stops playing and is a crucial indicator of acoustic quality. In the RFH, the sound still dies away a little too quickly for large symphonic works, but for chamber music and much modern music, the hall has a good sound. The remodelling of the RFH has gone as far as is possible using the natural acoustics of the space. The best way to improve it further would be to reinstate a electronic enhancement system. Modern digital systems can sound wonderfully natural, and this could be done at a fraction of the cost of building a new hall. Simon Rattle recently described the Barbican’s Hall as ‘serviceable‘, and that is probably a fair description of the acoustic quality both from scientific listening tests and from detailed measurements in the hall published in the literature. The ceiling is too low, a hangover from the space being originally conceived as a conference facility rather than an auditorium for classical music. Without sufficient volume, the sound in the hall dies away a little too quickly. The other problem is the shape. The first few reflections to arrive at a listener are crucial to the quality of a hall. In a shoebox auditorium like Symphony Hall Birmingham, the first reflections off walls reach the listener from the side (see figure below). The music at both ears is then subtly different. It takes longer for each reflection to reach the furthest ear, and it is attenuated because the sound has to bend around the head. This gives the listener a sense of being more enveloped by sound, something that has been shown to significantly improve the music. The Barbican is a fan-shape with splayed walls. Such a design naturally lacks wall reflections arriving from the side (see diagram below). In the Barbican, this has been partially compensated for by angled wooden panels placed in front of the side walls. But this can only ever be a partial solution to the problem. The sad thing about the Barbican is that there was sufficient scientific knowledge in 1982 to avoid many of the problems. Maybe what was lacking was enough case studies where science ensured a good sounding hall to convince the architect that he should accept what the acoustic designers were saying. A refit to the Barbican at the start of this century helped improve the acoustics. But like the Royal Festival Hall, there are fundamental issues in terms of size and shape that can not be solved with further tinkering. Like the RFH, however, a modern electronic system would be a good solution if only the classical music aficionados would accept it. Does London need a new hall? 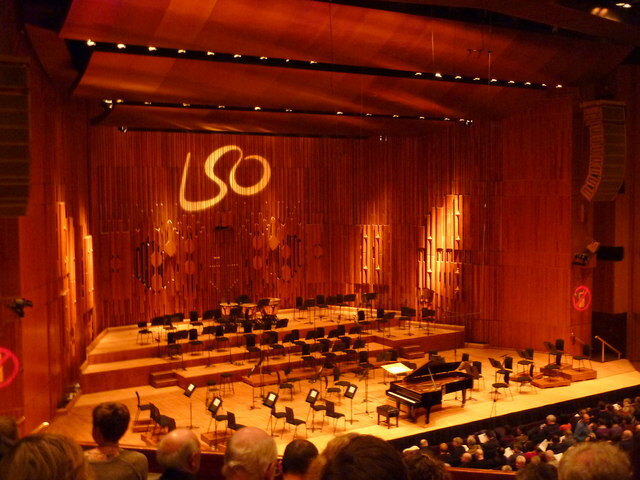 Undoubtedly, Simon Rattle and the LSO would sound better in a modern hall constructed following acoustic engineering. But is it worth the money? Is there evidence of soloists avoiding London? Is there a problem selling tickets? What do you think?